The roar of a Victorian-era retail giant. Source: the Globe, September 7, 1858. During the late 19th century, several downtown Toronto dry-goods merchants developed the potential to grow into major department stores. 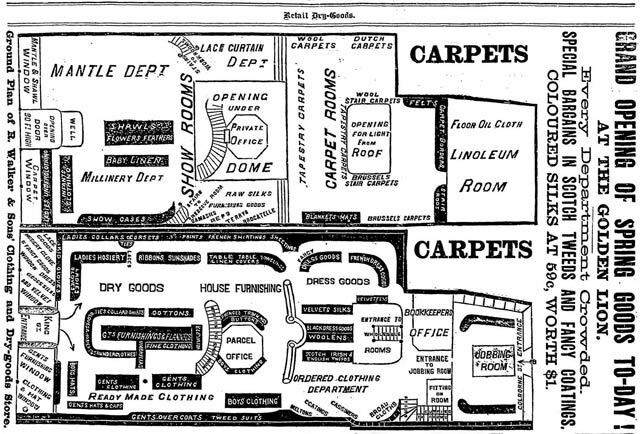 While Eaton’s and Simpsons evolved into national retailers, their competitors either couldn’t tackle the two giants or fell by the wayside for other reasons. One could-have-been-a-contender was Robert Walker and Sons, a.k.a. the Golden Lion, which was considered the largest retail business in Ontario in the late 1860s. 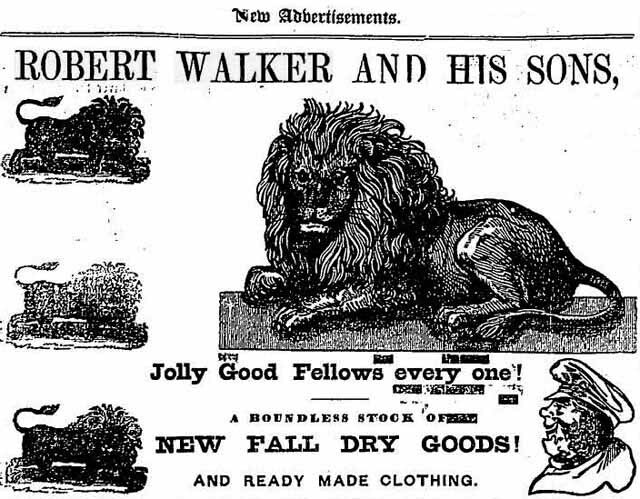 A native of Brampton, England, Robert Walker moved to Toronto in 1829, where he quickly entered the local clothing business. Around 1836, he formed a partnership with Thomas Hutchinson and operated a store on King Street east of Yonge. Around 1847, Walker opened up his wallet and spent a spectacular amount for the time period ($30,000) to build a stone structure at 33-37 King Street East to house his business. Two years later, the store adopted a golden lion as its symbol. 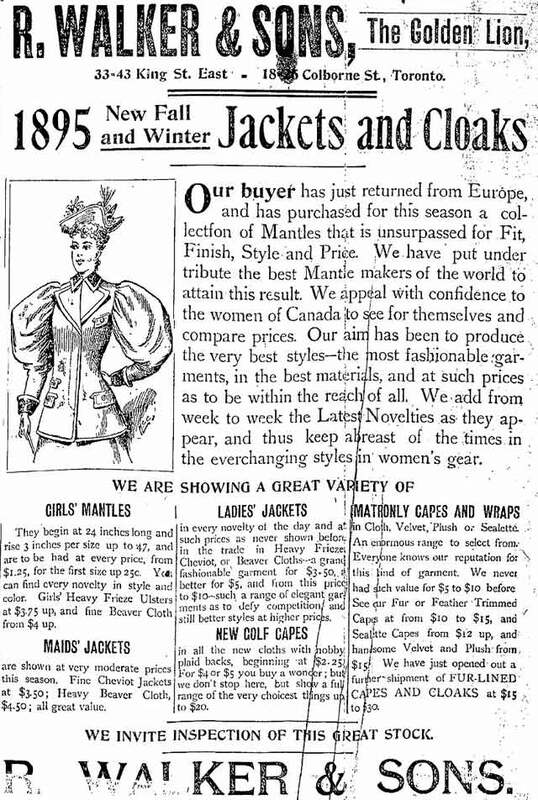 Source: the Globe, March 19, 1881. Source: Toronto Star, September 25, 1895. Though the store doubled in size again in 1892, by 1898 no one was left in the Walker family to run it. Unlike its competitor Simpsons, where founder Robert Simpson’s sudden death in December 1897 prompted his survivors to sell out, the Golden Lion closed its doors. Subsequent occupants included another short-lived department store and a Liberal campaign office during the 1900 federal election. After the stone lion was removed on April 6, 1901, the store was demolished to make way for a prominent new development. “In Toronto,” the Hamilton Herald observed, “they are pulling down the old Golden Lion to make room for a new White Elephant in the form of a palace.” The store’s replacement has stood the test of time as a downtown landmark—the King Edward Hotel [PDF]. Additional material from Lost Toronto by William Dendy (Toronto: Oxford University Press, 1978); the January 19, 1858, February 23, 1867, and October 6, 1885 editions of the Globe; and the April 12, 1901 edition of the Toronto Star.